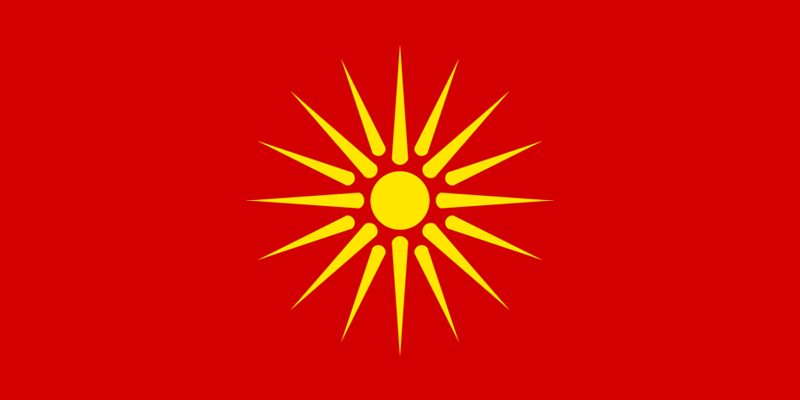 The flag of the Republic of Macedonia is red with the golden yellow sun. The sun has eight primary and eight secondary rays, slightly milled in the first half, intermittently and symmetrically arranged around the solar disk. The primary solar rays are directly detached from the solar disk, and the final outer length of all sixteen sunspots coincides with the outer periphery of the sun. The diameter of the solar disk is one-seventh of the width of the flag. The ratio of the diameter of the solar disk to the length of the primary solar beam is one to two, and the ratio of the length of the secondary and basic sunlight is seven to eight. The center of the sun coincides with the point at which the diagonals of the flag meet. The ratio of the width and length of the flag is one to two.